There are 2 things that drive me crazy about people. Actually, there are about 1,143 things that drive me crazy about people, but for the sake of this blog, I'll keep it to the two that pertain to this recipe and something that just happened. The first is when I sell something on Craigslist. 99% of the time, the items I sell are very reasonable and in pristine condition. It grinds me to no end when people try to get my goods for nothing. I was selling a brand new pair of Strawberry Shortcake fleece pajamas - with tags attached, perfect for gift giving as they were thankyouverymuch - for $8. I originally bought them for $17.99, but decided to cut my losses and sell just below half of what I paid since I wasn't going back to that shop I bought them from anytime soon. I had a buyer ask if I would let them go for $3! THREE DOLLARS!?!? Give me a break. The second is folks is people that don't share recipes. I understand that your Aunt Dottie's 100-year-old soufflé recipe has been the family secret for years, but don't tease me with photos, tell me how delicious it is, let me moan through it, and NOT expect me to ask for the recipe. That's just cruel. In my opinion, recipes are like good advice. They're meant to be shared. Don't be so difficult. I'm not going to sell it and make a million dollars on your recipe...and even if I did, you snooze, you lose. Just kidding. Fortunately, I'm not that kind of person. I'm a lover, not a fighter and it's just not in me to be any other way. I first found this recipe online a few years ago. The site I got it from had amazing photos with step by step instructions. What could go wrong? Everything. I was so disappointed. Mine looked nothing like theirs and I'm sure it did not taste the same either. What a waste. Last year, my MIL picked up the cookbook, Delicious Disney, by total coincidence at a garage sale. Guess what was in it? You betcha. This beauty. I did a cartwheel (true story!) When I went back to the site, I realized the author had the posted the incorrect recipe. Unfortunately, this is not the first time this has happened. I get so annoyed because ingredients are not cheap. Some recipes I make can cost up to $20 when all is said and done. Anyway, I gave it another shot correctly and we all absolutely moaned through it. 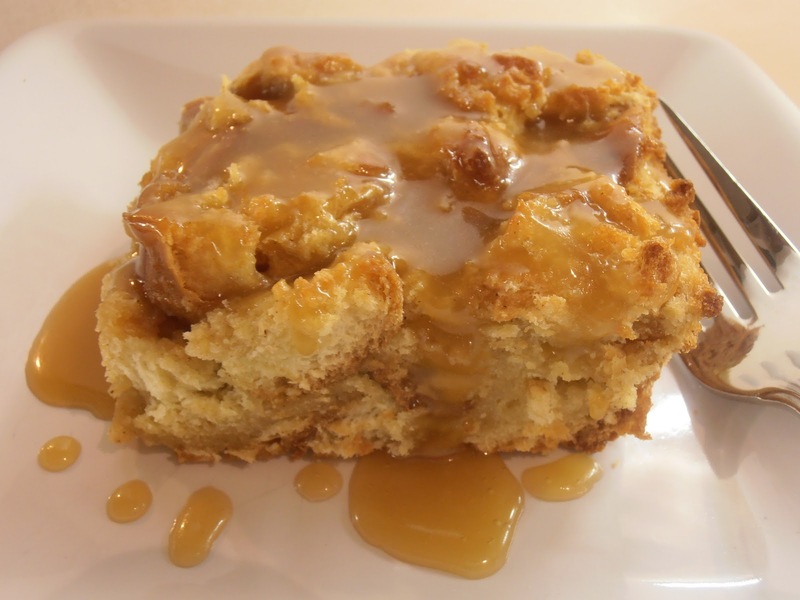 We love it and it's the only bread pudding I ever make. Even my gluten-intolerant husband can't resist it. He pays for it the next day, but says it's worth every bite. You may gain 5 pounds eating this dessert, but I assure, it is worth every swear word you will speak when it comes time to put on those skinny jeans for a night out with the girls. Heat oven to 350ºF. 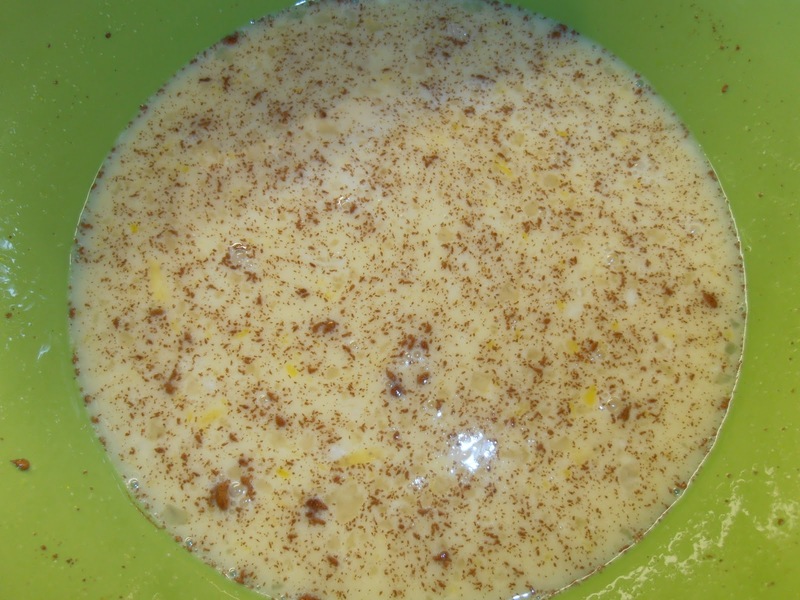 In large bowl, whisk eggs, milk, salt, sugar, cinnamon, and nutmeg. 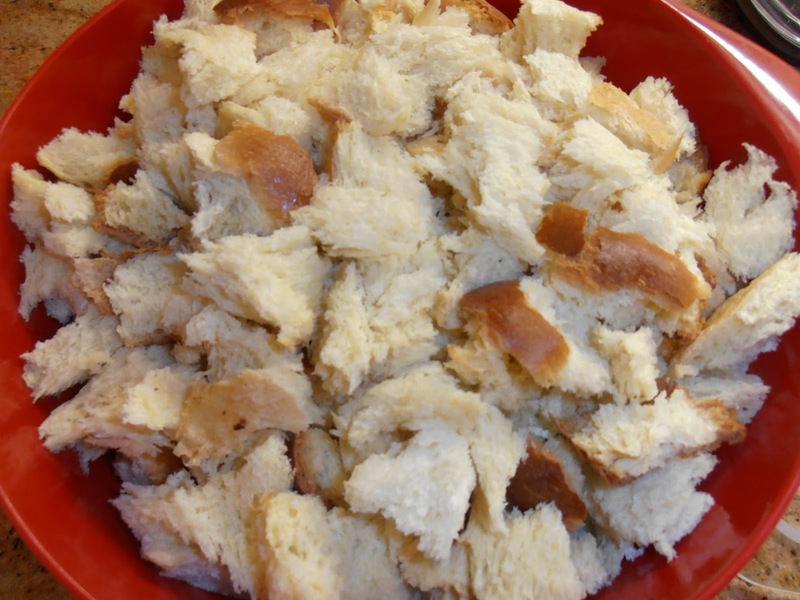 Cut bread in ½-inch cubes. I just tear them. Add bread, pineapple, and coconut to egg mixture. 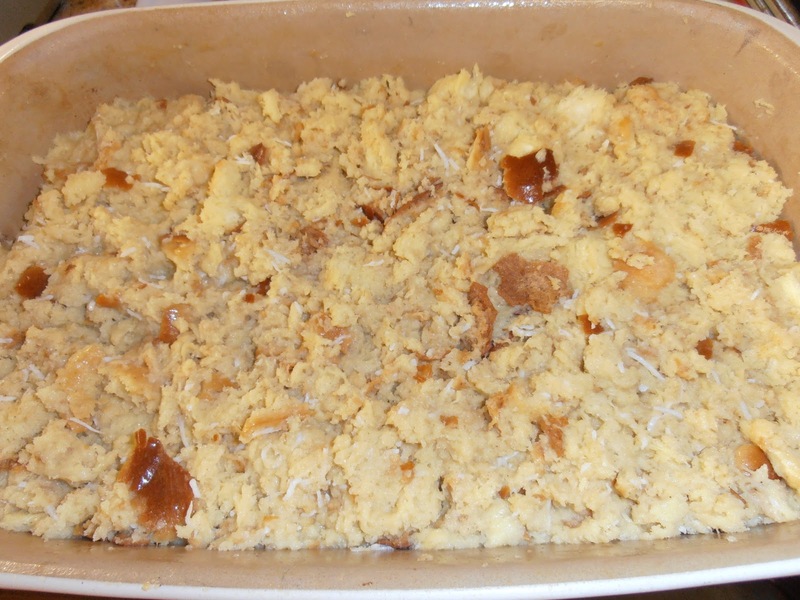 Grease large baking dish with butter. 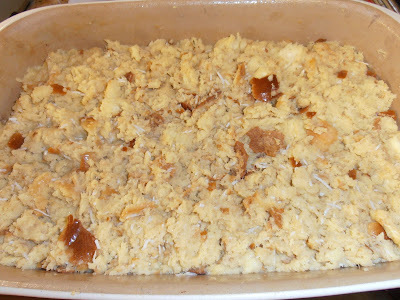 Add bread custard mix to the greased baking dish. **The recipe calls to bake for 1 hour and 10 minutes. I have found that it was too long and didn’t give the bread pudding it’s pillowy inside that I love. After several attempts, I found 40 minutes was perfect. Remove from oven. Let stand 5 minutes. In a sauce pan, combine dark brown sugar, corn syrup, butter, and half of the heavy cream. Using high heat; bring to a rolling boil. 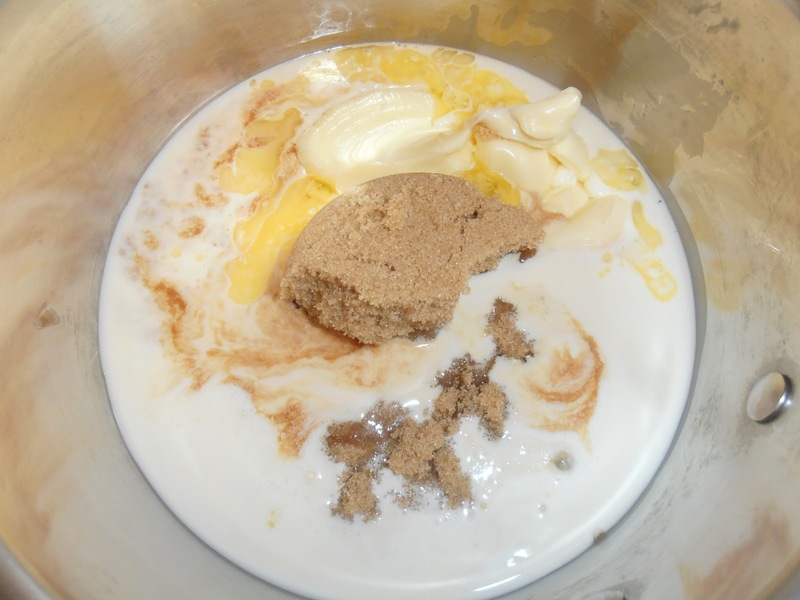 Allow mixture to boil 10 minutes and add remaining heavy cream. Let it boil additional minute. Add rum (if using) and vanilla extract. If you want to use the bananas, rum, and flambé the sauce, here are the instructions to do so. Amaze your friends and family! I would, but knowing me, I would burn the house down! Carefully flambé the pan using a long stemmed lighter. Let boil until the flame goes out. Reduce to a simmer and stir with a high heat spatula. Peel and slice bananas; add them to the caramel sauce. Remove the caramel from the heat and set aside. Place scoop of ice cream on top each portion of bread pudding.